Once you have taken the perfect passport picture from MakePassportPhoto.com, at no cost – you may follow the following guideliness to print them at home. This tip is pretty obvious. If you have taken photo using a VGA camera you cannot expect the passport photo to be of high quality either. A “2 mega-pixel” photo is decent enough to get you a good passport photo. Anything more is an advantage. Tip 2: Is your picture with defects? is it too dark? unfocused? Check the photo itself to ensure there are no specks or noise. If there are, use your favorite photo editor to remove them if possible. Adjust the brightness, hue, saturation to your satisfaction before uploading it here. Make a backup copy before doing this. But make sure you select the correct paper size before creating the passport photo in my site (Make Passport Photo). You can take advantage of this to make up to 40 passport photos from a single print out. Isn’t that amazing?? This is very important. 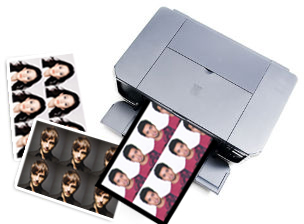 Only use a quality printer to do the job. Check your printer if it can print high resolutions with at-least 300dpi to get photo studio quality. You don’t need a super high-end machine to print, just go for a mid-range inkjet printer that’s suitable for home use. Tip 5: Check your printer setting. Make sure you adjust the settings correctly. Make a note of the following setting in your printer setting. PS: You can go to MakePassportPhoto.com to make upto 40+ high quality 300dpi passport photos in a single page at no cost. Thank you for this great service. However, I have a question, how can I have only one photo to save instead of multiple photos? You could always print the entire sheet and cut as many number of photos from the print sheet. Why would you want to have just one photo with empty spaces for printing? ’cause sometimes we do need upload a single photo file to website for the application. once i click the download, where is the file save to. i couldn’t find it. please help. Download should start automatically once you click download. I advice you use the latest Mozilla,Chrome,Safari or Internet Explorer. i don’t have photo printer at home. can i print photo in the supermarket photo developing machine. Yes you can dipti 🙂 just take the downloaded image in a pendrive or a CD to the store. What size do we print at walmart or cvs? they have so many differnt ssize prints its confusing me. I have created a passport photo for US size ie 2X2. Which size print do I select at Walmart or CVS to make sure the output photos are of the same size as specified? Hi Maverick, the standard photo size is 6x4inch. However you have an option at the makepassportphoto.com/service.php page to select the paper size at the time of creating the passport photo. You can use the same paper size in walmmart or cvs. I am trying to print 45mmx35mm photos for a French visa. All works fine until they are printed. They print as 40×31. This won’t work. During the process, I was forced to crop, which should not have affected photo size, right? Borders are turned off on the printer, we have a good printer with high res. How do I get them the size I requested? “Fit to page” makes them smaller. 100% makes them huge. I shouldn’t have to guess what % to select on the printer, should I? I’ve tried 8.5×11 and A4 paper selection. Same result. Thanks for a quick response from someone! Mary, after printing in A4 and 8.5*11 paper sizes are you getting white border surrounding the green/blue area with MakePassportPhoto.com watermarks? Mary can you tell us which paper did you select at the website during the creation of the passport photo and which paper didi you actually print on? Alternatively you can select 6×4 in makepassportphoto.com and use an A4 paper to print two 6×4 photos easily through windows 7,8,10. Please check here for more instructions on how to get true 6×4 prints. u all are telling us like same.